Saint Andrew the Apostle – Saint of the Day from My Catholic Life! Andrew was a fisherman from Bethsaida in northern Israel. He lived on the shores of the Sea of Galilee, which is really a lake where many of Jesus’ miracles took place. Jesus chose mostly fishermen and small farmers to be His disciples, perhaps because in these professions a man can plan, sweat and calculate and still, in the end, fail. Success is not appreciated unless failure is an option. Farmers and fishermen must depend on God’s providence for success. No amount of preparation can make the clouds open and the rains pour down, and no amount of careful planning will make the nets burst with fish. Farmers and fishermen are hard-working, careful, thoughtful, and yet entirely dependent on the weather and other factors outside of their control. They must work, pray and trust in God in equal measure. They must have the discipline of faith. These are the qualities that made Andrew and others such great disciples. Andrew was first a disciple of John the Baptist. Andrew was at John’s side when a man whom John had recently baptized walked by. “Look, here is the Lamb of God,” John exclaimed (John 1: 36). Andrew was curious and, along with a few of John’s other disciples, followed the mysterious man. The next day Andrew breathlessly told his brother Simon “We have found the Messiah” (John 1:41) and brought him to Jesus, who renamed Simon as Peter. From that point forward, Andrew became one of Jesus’ most reliable Apostles, a leader among the Twelve whose name recurs time and again in the Gospels. There are various traditions about where Andrew evangelized after the Ascension of the Lord, with most focusing on Greece, Turkey, and north of the Black Sea. There are no certain facts about his manner of death, although various apocrypha state that he was tied to an x-shaped cross and then preached from that pulpit for days until he died. 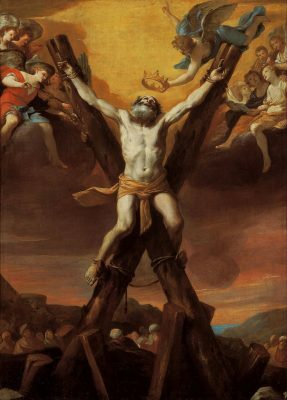 Saint Andrew sat at the table of the Last Supper, felt the hot breath of the Holy Spirit on his cheeks at Pentecost, saw the radiant body of the risen Lord with his own eyes, and endured physical hardships as he carried a new religion into old lands. We can suppose that he, like many of the Apostles, was content with his way of life before he met the Lord. Fishing on the tranquil waters of a lake, sharing daily meals with his extended family, chatting in the evenings with old friends before a fire. The Apostles did not abandon their lives to follow Jesus because their lives were miserable. It was a question of more. More meaning. More truth. More fulfillment. More challenge. More daring. There is nothing wrong with a good life. But there is something better about a great life. The Apostles were mostly simple, intelligent, hardworking men whose outstanding characteristics were courage and daring. Many people who could have followed the Lord did not. The rich young man went away sad for he had many possessions. Perhaps the greatest thing that young man had was his youth. Andrew and Peter and John and Simon and all the others were young too. Yet they did not go away sad. They stayed, they followed, they were challenged, and they were contented. Andrew gave his back to his father, his boat, his nets, and all that was known and comfortable. He traded what was good for what was better. And for that generosity and daring we remember him today, so many centuries later. He was of that generation of pathbreakers who sowed the seeds whose harvests the Christians of today have reaped and enjoyed. Saint Andrew, we ask your intercession as an Apostle in heaven to make all Christians more generous in responding to the Lord’s invitation to follow Him. Embolden us to share the faith with our families, as you did with your brother Simon Peter, and to be outspoken in our beliefs.